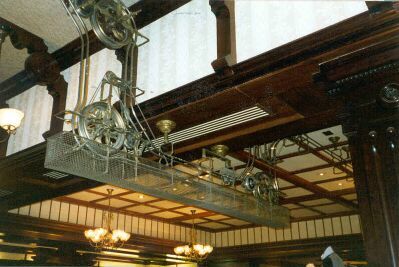 This is the system in the Emporium of Disneyland Paris. Original systems proved unsuitable so Walt Disney Imagineering decided to make their own. It was designed by Eddie Sotto and the chief field installation art director, Eddie Johnson. 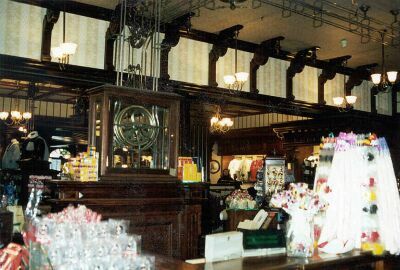 It was inspired by the photograph of Abraham and Straus Department Store in New York interiors at the turn of the century. Alain Littaye and Didier Ghez in Disneyland Paris: from sketch to reality (Paris: Nouveau Millenaire Editions, 2002) write: "You'll also see the little mechanical baskets that were used 100 years ago, when counter staff were not allowed to handle money. They had to put the money into the baskets and send it off to the accountants room, then the accountants sent it back with the change." Here the track bends down to pass under a beam and is protected by wire mesh. I did not see it in operation, but Eddie Sotto informed me that the carriages are made of screen and are like small boxes. They must be small enough to pass through this guard and the ones shown above.